Turkey - a country with one of the biggest armwrestling teams in the Europeans or Worlds. But a few of us know that they also have the biggest referee team in the World! 800 active referees! It's probably more than the rest of the World combined. Let's talk with the Head Referee of Turkey - Aydin Necip Telyakar. Hello Aydin! You are one of the most experienced referees I know. Tell us more about yourself. – My name is Aydin Necip Telyakar and I am a referee since year 2000. I have worked as head referee in different terms. In this term, I am head referee since 2016. I have not participated in any competition as a competitor. I am a Physical Education teacher. Last week you had a huge referee seminar in Turkey. How did it look like? Was it directed to each and every active referee in your country or only to candidates or those who want to gain a higher referee level? – It was great. Weather conditions were pretty extreme. There was a huge tornado, buses and planes rolled over in airport and some people sadly lost their lives during the incident. 500 people applied to participate in seminar however only 270 people were able to make it due to weather conditions. We organize this seminar year every year. If a referee do not attend to this seminar, they are not allowed to participate in any armwrestling organization held in Turkey for that year. Head referee leads the seminar. WAF rules are explained in seminar and exam is taken in two parts, theoretical and practical. There is only exams for existing referees in seminar and no exams for those who would like to become referee. Does that mean that Turkey has about 500 active referees? It’s incredible! It has to be really hard to organize such a big community and work with all of them. You have to be very well organized. Do you have Referee Panel to help you? – Yes, we have referee panel. We announce panel and referees apply to participate in panel. 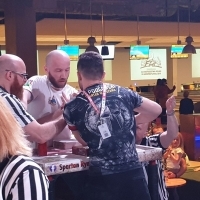 After that those referees are hosted in a hotel with all expenses covered by Bodybuilding, Fitness and Armwrestling Federation of Turkey and they participate in educational panel. Bodybuilding, Fitness and Armwrestling Federation of Turkey's president and board of management chooses head referee and head referee serves for 4 years. Head referee and 6 board member referees make the decisions. How can you become a referee in Turkey? What kind of referee grades do you have and how can you obtain a higher level? How often can you take an exam to raise your level? – There are requirements to become a referee in Turkey such as educational background, age, health etc. If a person meet all requirements, they are able to participate in referee course and if they become successful, they become referees. There are 3 grades, aday hakem – junior referee, il hakemi – senior referee, ulusal hakem – master referee. It is possible to obtain a higher level after 2 years if succeeded in exams. In Turkey, it is not more often than once a year as in Poland. Being a referee is a very hard job, and often not pleasant, because a lot of the competitors have complaints about referee calls. But the number of referees in Turkey is enormous. What do You think brought so many people to become a referee in Turkey? – For the last two years, Armwrestling is included as mandatory sports competition between schools in Turkish educational system and since Turkey's population is 80 million, current amount of referee is not enough and we are planning to increase active referee count to 1500 from current 800. Referees from Turkey on Europeans or Worlds are mostly strong Senior level. They are all prepared, with good knowledge of armwrestling rules. How do you select referees to represent your country on international competitions? Are there any requirements that need to be fulfilled to come to Europeans or Worlds? – We are paying close attention to referees in organizations held in Turkey and we are choosing referees for Europeans and Worlds depending on their success during these organizations and their experience. It’s similar to what we have in Poland. Only referees with the highest national level and at least 4 years of experience can go to Europeans and Worlds. Just to ensure a good level of our referees. What do you think is the strongest side of Turkish referees and what do you want to improve in the following years? – Turkish referees have discipline. Being fair and objective during all matches regardless race, religion, gender and disability is essential principle. No one in Europe has such a large experience working with such a huge number of referees. Do you have any tips for head referees from other countries? What can they do to gather such a big community as you have in Turkey? – I think they could work on including Armwrestling in school competitions to create foundation to gather bigger community in their countries. What plans do you have for the nearest future? – We have educational plans to increase the amount of arm wrestlers in schools. Thank you very much for an interesting conversation. And I wish you good luck with your plans! Big thanks to Engin Terzi for helping with the translation!